Readmission rates after CABG can go as high as 20%, especially for patients with multiple risk factors. My Heart Notebook is the perfect companion after any major heart surgery (including heart bypass or heart valve replacement or repair surgery). While in the hospital, patients are given countless instructions about recovery. This can be overwhelming for both patients and their families, and retaining information usually presents a challenge. 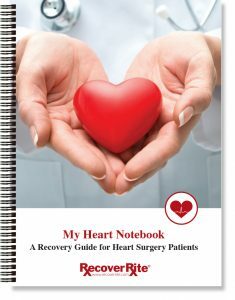 My Heart Notebook provides your patients with exactly what they need to know to recover at home. What can I expect after heart surgery? How much pain will I have after heart surgery? What about my emotions and depression?